With anticipation I approached Jacks Garage, having only seen Poppy in photos and based on the previous call I didn't know what to expect. john and Viadas met me in the tiny reception area that is adorned with photos of customers with Joseph (the owner.) You have to take the photos with a pinch of salt, he is either really proud of his customers or he can't stop admiring his own image... Not my place to suggest which. They ask how much I paid for Poppy, so I tell them, they ask if I saw her first "no" was the tiny and short reply that passed from my lips. Viadas is shaking his head and mumbling something about "it is bad" I look at him and he continues "possibly the worst one we have ever seen." John is more upbeat about it "sure it's bad, but we can fix it"
Tea and small talk over John takes me to their storage facility to see Poppy, the light isn't great where she is, thank the stars, but already I can see what was meant by "Swiss cheese"
There are holes where there shouldn't be, including massive ones in the solid steel rear bumper... Like a mad giant termite had attacked it, not a well campervan at all. John kicks the side of her, "careful" I start to mumble as half of the panel detaches itself and falls to the ground. "Don't worry" says John "I was going to replace that anyway." 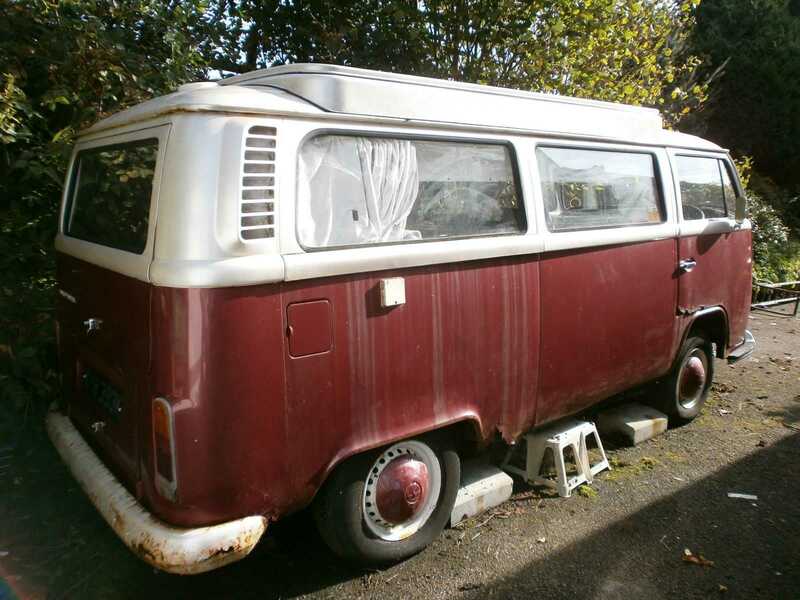 On her plus side, her interior is in good condition and it is a Devon Moonraker complete with the swing out cooker and bunks... Part of the appeal of buying her is the interior. John says something but I didn't quite catch it, I ask him to repeat it and he says "it's a big job but I'm not scared off it, want us to go ahead after we price it up?" Now it's my turn to look at him as if he is mad... "Of course, she's worth saving" I say. We amble back to reception for more tea and then Viadas shows me some of the parts that were in Poppy, including a new complete front axle. I head back back to the tube after, full of tea and dread about the total bill... Johns final words ring in my head "relax, we can fix her up like new"
We have a price and a man with a van to move Poppy, they think it will take about 8 hours to get from her present home in a barn in mid Wales to Jacks Garage in West London. Very exciting to see her move for the first time in over 6 years, even if it isn't under her own steam. After a a tense wait we got the call from Viadas at Jacks to let us know she has arrived in one piece although the actual message we got was kind of worrying as Viadas just said "you need to come and see this one, it's got more holes in it than Swiss cheese." Have we bitten off more than we can chew, this could be a nightmare but in our opinion any Campervan is worth saving. 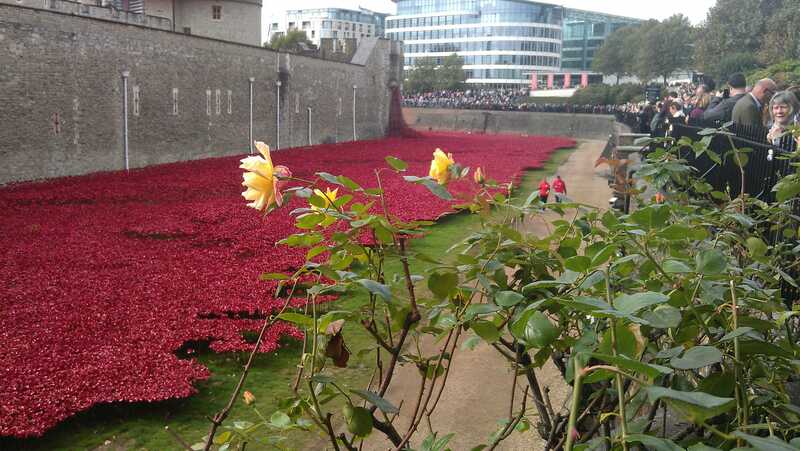 Looking at the photos of her, and over a strong coffee there has been a debate over what to call the new girl in our life, with her colour being a deep dark red, and the email coming through at the Tower of London it became a no brainer to call her "Poppy". We are using Shipley and Anyvan to run reverse auctions for transporting Poppy to London and hopefully we can get a good price. What on earth have we just bought ? Earlier in the day, we had set up a bid for a rather sad looking Campervan and then went out to enjoy the amazing sight at the Tower of London, along with what felt like the rest of London. 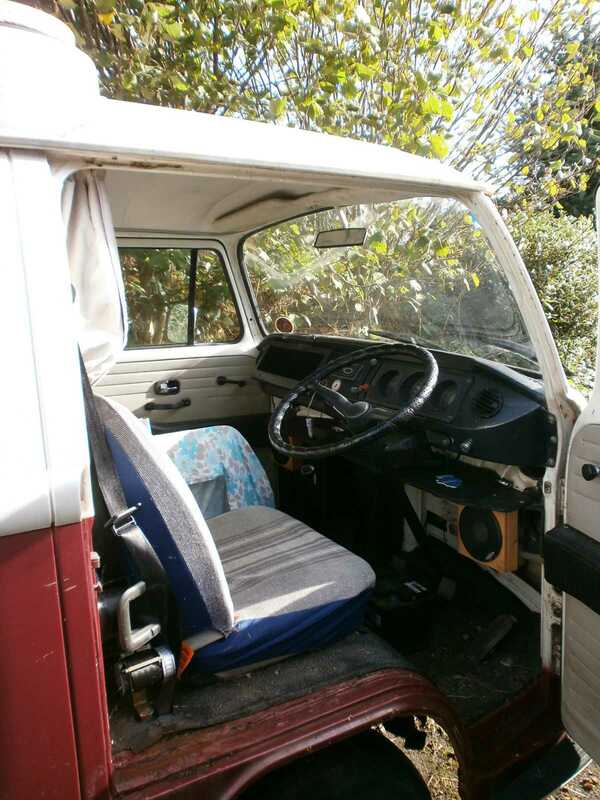 Upon exiting the tube, I noticed an email had come through to say that I was the successful bidder for a 1972, Moonraker conversion VW Campervan. The only worry was that there was a line in the advert that highlighted how bad she was "Please note: This is a project that requires welding (front & rear) + mechanical overhaul. The engine runs over OK but it will require collection with a trailer."